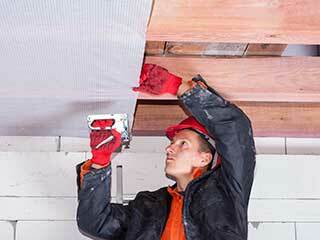 Your attic's insulation is vital to keeping the energy costs of your home manageable. If its integrity has lowered over time from damages or aging, then it's likely letting air escape. That means the only way to keep the temperature stable is by running the heat and air conditioning more, which may be why you notice your bill rising every month. Let us assist you! Our experts can add more insulation to what's there, or remove it in favor of all fresh materials. We can even help you in deciding what type will be best suited to your home, and will make sure it's the proper amount needed for your specific structure. Need it installed in a brand-new attic? We can do that too! Aside from just being frustrating to deal with and remove from your home, rodents can also cause a lot of issues you might not have considered. They tend to destroy the insulation to use as nesting, so yours may need to be replaced. Perhaps more pressing is the waste they leave behind, as it can carry diseases. If you step through it, or bring down some belongings that have been contaminated, then it will easily get into your home. We offer decontamination services that will sterilize every bit of your attic, and make sure this won't happen! Then, we can install rodent proofing so it won't occur again. Is Dust The Issue? Attic Cleaning at Its Best! Our technicians can give your attic a good cleaning to take care of that! It may not seem like something to be worried about, but it can cause a surprising amount of trouble in the long run. Not only can the particles enter the air and lower the quality, but it can allow mold to grow and spread. In both cases, the health of you and your family will be at risk, so it's best to make sure your attic is cleared out! Your air will be fresher, and home safer. Let our team at Air Duct Cleaning Malibu take care of it all for you.